The holiday cottage of "2 The Bar" can be found in Richmond in North Yorkshire. This cottage sleeps 4 people, and has 2 bedrooms. The cottage has the following bedrooms: Two bedrooms with TV: 1 x super king-size double, 1 x king-size double. Bathroom with bath, walk-in shower, basin and WC. Ground floor basin and WC. Kitchen with dining area (seats 6). Utility. Sitting room with woodburner. Gas central heating with woodburner. Electric oven, gas hob, microwave, fridge/freezer, washer/dryer, dishwasher, 3 x TVs with Freeview, DVD, CD/radio, iPod dock, WiFi, selection of books, games and DVDs. A family sized holiday cottage near Richmond, 2 The Bar could be the one for you. These are the reviews for 2 The Bar. There are 10 reviews. We would have liked a shaving mirror in the bathroom, just to complete the fabulous facilities in there. In the large rear bedroom there was noise from above, sometimes very early in the mornings, like furniture being dragged around, and someone singing! We looked outside, and the cottage is attached, for want of a better word, to a larger property, with part of it over the bedroom, this property looks as though it may be a shop or furniture store, as we noticed people taking some items in there via the back during our stay. Overall, we had a wonderful time, and we would love to go back again, but perhaps, a word spoken about noise so early, around 5am on one day, and 5:45 on another. The house is certainly a five star accommodation and being so close to the square and the wonderful pub the Talbot . We spent two days out at Musker walking in the fabulous Dales , home in Australia living in the Heritage Blue Mountains we are surrounded by different beauty. As we travel by public transport found getting around to other towns so easy. Hope to return next year to Richmond so will use Sykes also The Bar if it’s available. In excellent condition equipped with all your needs, would definitely recommend. The cottage was comfortable and clean and had everything we needed. It was situated ideally in a quiet lane less than a minute from the market square. It was excellently furnished and decorated. Spacious and well laid out. The only issue was the parking situation. The space next to the property was inaccessible for anything other than a very small vehicle with 4 wheel drive. We had to pay £15.00 to park in a public car park at the bottom of a very steep hill. The cottage is very well equipped and provided for all our needs and expectations. The cottage was cosy and ideal for relaxing evenings. The bedroom large and comfortable and the beds gave us a good nights sleep. Heating and hot water system very efficient and the bathroom facilities a luxury. Very nice welcome pack which was appreciated. Richmond is a gem of a place with plenty to do. The people are so friendly and we had many random chats. 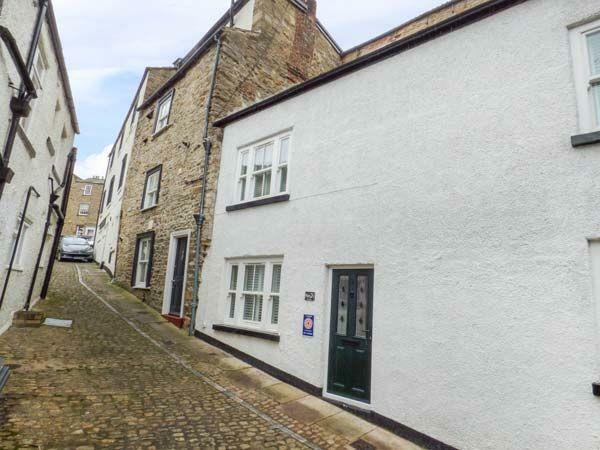 The cottage is ideally placed near the centre of town with ready access to: shops, places of interests and very good places to eat. Richmond castle is worth a visit. A must is a tour of the theatre. The tour lasts approximately an hour, is full of interesting history and gives the opportunity to go backstage. We ate at:The Kings Head, New Treasure Garden and Alessandros. At all three the food was excellent. Wonderful coffee and chocolates at Mocha. Quality pies at: The Noted Pie Shop and superb quiches and salads from the Angel Share Bakery. On the last day of the holiday we enjoyed a very good breakfast at the newly opened Fleece. If you like beer and cider try the Richmond Brewery at the Station. We drive an Audi Q2 and we could not park at the cottage and ended up parking at The Green. We think that parking at the cottage is only available to people with a smaller car. However, you can get a £15 weekly permit to use the pay and display car parks which are not far away. We had a superb holiday and certainly we will be back again. Cleanliness could have been better the tiles round the bath needed a good scrub ( the grout) and the toilet behind the toilet seat and cistern could have been a lot ceaner not to mention the toilet brush ( yuk). The dust on the back of the stand of the tv in the smaller bedroom I could have written my name in it. The sitting room was very dark and cold looking it could certainly be improved immensely by changing the curtain's, cushion's and getting rid of that horrid red colour behind the fire sorry I couldn't be more positive but have written it as it was. If you're looking for other cottages around 2 The Bar, we've got some cottages below which may take your liking. There are 53 cottages within 5 miles of 2 The Bar - and they have reviews too.